Died Tuesday March 26, 2019 at home. Violet was born September 28, 1925 on a farm near Arlington, NE. to Paul and Elsie ‘Dahlkoetter’ Knecht. She was baptized and confirmed at St. Paul’s Lutheran Church north of Arlington. 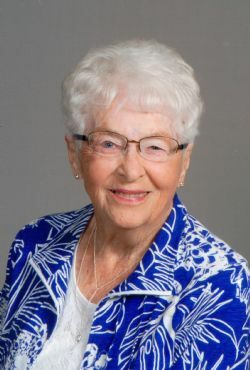 After graduation from Arlington High School in 1944, she moved to Fremont and worked at Gamble-Skogmo and Kimberchicks Hatchery for a few years. In 1976 she went to work for Jacobs Floral and Bridal Shoppe, purchasing the bridal shop in 1983. In 1996 she sold the shop and retired. She married Victor H. Stork on April 27, 1947 and he died on November 4, 2002. Survivors also include grandchildren, Mitch and Cassie Feldman, Dan and Clarissa Feldman, all of Litchfield; Nick and Laura Smith of Omaha; Kristina and Randy Swift of Fremont, and Jason Stork of Cedar Bluffs. Great-grandchildren, Caydence, Knox and Kenna Feldman of Litchfield, Jayden and Amara Swift of Fremont, Miles Smith of Omaha, and Otto Stork of Omaha. Violet was preceded in death by her husband and sisters Lucille Knecht and Darleen Schmidt. The funeral will be 10:30am Friday, March 29 at Trinity Lutheran Church in Fremont. Lunch will follow the service with the burial to follow lunch in St. Paul’s Lutheran Cemetery, north of Arlington. Visitation will be Thursday from 3pm to 8pm with the family receiving friends from 6pm to 8pm at the Ludvigsen Mortuary Chapel in Fremont. Memorials are suggested to Trinity Lutheran Church, Trinity Lutheran School and Trinity’s Katie Comfort Dog Ministry.